IPVanish Review 2016: How good is their service? IPVanish has become one of the leading VPN providers in the industry and I’ve been taking a look to see if they’re any good. IPVanish offers one service that is available over a 1-Month, 6-Month or a 12-Month period. Their pricing is similar to what else is out there and they’re actually a little cheaper than some other providers. You can make the greatest saving when taking their 12-Month package so it’s worth considering if you’re planning on keeping the service for a long time as there is a discount of over 40% versus paying on a monthly basis. IPVanish accepts a mass of payment methods including Visa, Mastercard, American Express, Discover, JCB, Visa Electron, Delta, Paypal, Alipay, CashU, Mister Cash, POLi, SOFORT Banking, Boleto Bancario, DineroMail, Przelewy24, Giropay, IDEAL, EPS and even Bitcoin. So whatever your payment type or where you reside in the world you should have no issue signing up. IPVanish has custom clients for both Windows PCs and also Mac computers. This is suitable for desktops, laptops and even tablets that run full versions of those operating systems such as the Surface and Surface Pro. The computer clients are what I class as full sized clients because they offer numerous features and options in a large window alongside the possibility to get connected and stay secure. The software allows you to connect via the OpenVPN, PPTP or L2TP protocol which I found was a nice touch as not all clients allow you to use the range of VPN protocols. Further features are broken down into the following sections. Allows you to easily view the current status of your connection location. A more in depth connection view that allows you to connect for specific purposes, search in a list or use the world map to find a VPN server. Various settings to allow you to customise how often your IP Address should change and carry out maintenance such as reinstalling the OpenVPN drivers if necessary. Make account changes or check the status of your account from within the software. A handy link that opens up the support section of the IPVanish website. The software is really easy to use and will be suitable for users of all abilities. There are features if you’re an advanced user but if you simply want to connect and forget about the VPN service then that can be achieved within just a few clicks. IPVanish has mobile apps for both Android and iOS devices. These are suitable for mobile phones and tablets including the iPad and iPhone. The mobile apps are obviously a lot more basic than the desktop counterpart but allow you to connect using OpenVPN with minimal fuss so you can connect and forget it’s even running. The settings area is quite limited but it does allow you to select between the UDP and TCP protocol if you know what you’re doing which often isn’t possible on other provider’s apps, however, if you’re a beginner then you can simply leave it on default settings and it works out of the box. All connection is done via OpenVPN and to connect you can simply click on a location. These can be sorted by country, response time or capacity. A nice feature of the app is the green circle indicator that lets you know how utilised a server is so you can choose the best for the fastest experience. IPVanish has over 500 servers in over 60 countries which is great news if you’re looking for a good choice of VPN server. On top of that there are over 40,000 IP Addresses available on the network so if you’re looking to bypass some sort of block by IP Address or any other reason you’ll have no trouble with IPVanish. Servers are available in North America, Central America, South America, Europe, Asia, Australasia and Africa and most major countries have VPN servers in them. In the few remaining locations that don’t directly have a VPN server then in most instances it’s easy to find a closely located server which will allow you to get near top speeds when using them. IPVanish allows unlimited server switching which means you’re free to switch servers as many times as you want. In larger countries there are also multiple locations to choose from. For example the US has servers in 11 different areas with nearly 200 servers available to select in total. Other countries like the UK are covered in 6 locations, India 5, Turkey 3, Australia 2 and a whole host more. There are no download limits on the IPVanish service which is great news as you’re able to transfer as much as you want without issue. In my tests I found them to be one of the fastest providers with some of the top speeds. I had no trouble downloading, streaming TV services or browsing the internet in an everyday fashion, in fact, the service was fast enough to connect and just leave running in the background without noticing. Below is a selection of speeds I received when doing test downloads on 20th June 2016 with a 200 Mb/s connection from the UK. As you can see the majority of local servers are fast enough to connect to and carry out your day to day tasks. So wherever you are in the world with over 60+ countries you’ll be able to get top speeds. 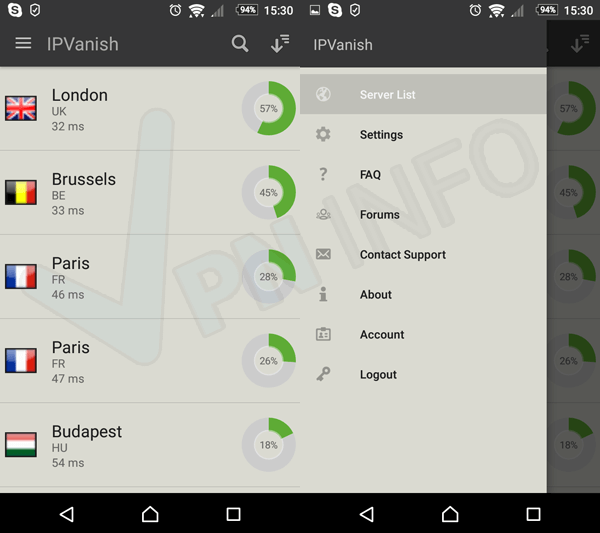 IPVanish is one of the best VPN services I’ve used. Not only are the competitively priced with the competition but they also blow them out of the water in many regards. With over 60 countries covered the service is suitable for a wide variety of needs and no matter what location there is likely to be a local server so you can maximise your speed. One of my favourite features of IPVanish is their download speeds which are second to none and whether you’re a heavy downloader, a video streamer or you just like to browse the web and carry out everyday tasks the speeds will be more than what you need. The mobile apps are a little underwhelming visually and the long list server selection although it can be sorted can be a little daunting. Although visually the apps aren’t the best they do get the job done and let you connect with ease which will be suitable for both beginners and experts alike. The software for desktops is much better and slightly more involved visually, however, it will still be possible if you’re a new user to make use of and there are further options to keep experts happy. Overall the service is suitable for a range of needs from most locations in the world and for just over $6 per month if taking an annual package it won’t damage your pocket much in the process. Definitely one of the best VPN services I’ve used. A 7-day money back guarantee allows you to test the service without fear of losing your money if you’re not as happy as I was. Get social and keep up to date with the latest VPN information. © COPYRIGHT 2019 TWISTEDFINGERS LTD. ALL RIGHTS RESERVED. Made with ❤ & Tea in England.